Sometime on the Friday prior to our visit, I decided that it had been too long since we had been to Disneyland. I sprung the idea on my wife and she agreed. Sunday morning, we packed the car and headed off to the Magic Kingdom. Leaving the decision to our four year old daughter, we started the day in California Adventure, heading to Ariel's Undersea Adventure. She knows that Ariel's ride is Daddy's favorite in the park. After the ride and several snapshots, I noticed that the line for Toy Story Midway Mania was under an hour. I had previously been hesitant to wait so long for a ride that I knew little about, but forty minutes seemed manageable. I'm happy that we waited because, 3D glasses notwithstanding, we had a great time. I was worried that our daughter would have trouble with the cannons, but she had a blast. When the ride was over, I acquiesced to a request for Mickey Mouse suckers (a perennial favorite), but I did not want to ride Mickey's Fun Wheel again. I have a terrible fear of heights and the extended trip around that wheel freaks me out. Luckily, my wife suggested that I finally indulge in a Disney corn dog (probably so that I would stop talking about it so often) while she chaperoned our daughter on the ride. The corn dog was a much better experience, though I will forgo the potato chips next time. When we joined up again, it was time for lunch. We rounded out our adventures in DCA with a round on King Triton's Carousel, Heimlich's Chew Chew Train, and Flik's Flyers. I finally assented to our daughter's request to ride the bumper cars. However after making it all the way through the queue, we were informed that the ride was down due to a PA system malfunction. We would have to save the bumper cars for another day. After having our fill of California Adventure, we crossed the esplanade to finish our day in Disneyland. It was then that I developed a splitting headache. While I'm usually tolerable when I'm feeling well, I understand that I am unbearable when I have a headache. Unfortunately, the heat that day was not helping to make me feel any better. I took some medicine and hoped it would pass soon. As such, our next four rides, It's a Small World, Alice in Wonderland, Mark Twain, and Winnie the Pooh, were less than pleasant experiences. It wasn't until we reached the queue for the Haunted Mansion that I started to feel like myself. Just in time for that ride to break down too. We knew from experience that if we waited long enough, the happy haunts would stop their meddling and get things moving again. We were again rewarded for our patience and enjoyed our jaunt through the darkness. I rewarded my wife and daughter for putting up with me with ice cream from Gibson Girl, as well as their choice of candy from the Candy Arcade. Our daughter chose candy-covered crispy treat. My wife selected a peanut butter sandwich (that I almost chose as well). I picked the English toffee. We dutifully packed up our treats and took them home with us, ending the day. The lesson I took from the day was to remember my limits. Disneyland can be a great time, but only when you are feeling well. Our next trip to the parks is scheduled for early September. Hopefully the weather will be more cooperative, as well as my head. 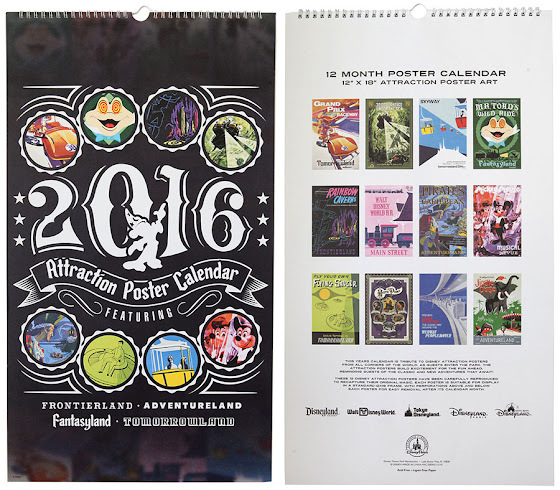 The Disney Parks blog announced that a new version of the Attraction Poster Calendar for 2016. This year's calendar includes posters from around the world instead of focusing on Disneyland alone. Several of these posters I'm only aware of from the Poster Art Of The Disney Parks book (which I'll getting around to reviewing some day). It is quite a wild and varied collection this year, covering a number of styles and eras. As happy as I am to see a new calendar, they need to use some of those beautiful California Adventure posters in the future if Disney really wants to hook me. For fans of Disneyland, there was exciting news at the D23 Expo this weekend. 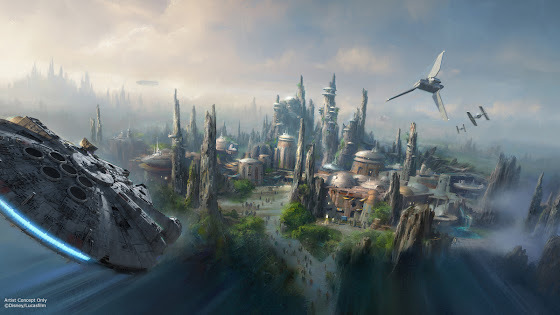 Bob Iger, Walt Disney Company Chairman and CEO, announced a fourteen acre expansion to add a Star Wars land to the park. Bob Chapek, head of Disney Parks and Resorts, and Imagineer Scott Trowbridge went on to describe what exactly the new land would entail. 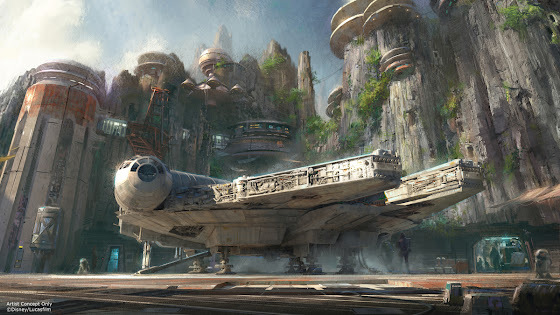 Set on a new world in the Star Wars universe, Disney is crafting a place better suited to Disneyland than the extreme environments normally present in the movies. The land will be entirely inhabited by characters from the universe, costuming all of the cast members as appropriate. There are two rides planned: one involving the Millennium Falcon and one involving a battle between the light and dark sides. There will even be dining similar to the Mos Eisley Cantina, which seems like a Star Wars fan's dream come true. Rumors had Disney demolishing Mickey's Toontown to replace it with a Star Wars land. But the current thought, as corroborated by the Disneyland Today twitter account, is that Big Thunder Ranch will become the new entrance to the land. @PaulYankees It's going to be in the Big Thunder Ranch area, inclusive of some backstage locations. While the new land is under construction, additions will be made to Tomorrowland to suffice those of us waiting for the real thing. Star Wars Launch Bay will exhibit the films and merchandise around the series, most likely in the under-refurbishment Innoventions building alongside the Marvel superheroes. Star Tours will be receiving another update to align the program with episode seven. Also, a new seasonal event called Season Of The Force will increase visibility of Star Wars in the park. The most concrete plan for the event is the new themed overlay for Space Mountain called Hyperspace Mountain. The Orange County Recorder reports that the city of Anaheim is likely to approve the park's plans with all speed. As well, the newspaper reminds us that it is likely to be some time before those plans come to fruition. Comparing this announcement to the most recent addition, Cars Land, we are likely two years from the company even breaking ground. Add in three years for construction and we are unlikely to see an opening until 2020. In other news, it looks like I'm back to the drawing board on my plan to fix Tomorrowland. If anyone one from WDI is reading, give me a call. I can get this all figured out. Things are moving fast for the Disneyland Resort. Between the announcement of a billion dollar investment into the resort and the recent purchase of nearby properties, speculation about expansion options is at an all time high. With the D23 Expo coming up, I need to get in on the action before Disney make some sort of announcement. Tomorrowland has always been the strangest part of Disneyland. Over the last sixty years, there have been four separate versions of the land. Each revision has attempted to rejuvenate the area. But before long, the present always catches up with the future and Tomorrowland becomes relic of dreams gone by. Science fiction and futurism will always have a limited shelf life. Before long, what once seemed like exciting possibilities eventually become quaint, even misguided. That is what the Imagineers have been facing for decades with Tomorrowland. How do you design a land of the future that will stay futuristic for more than a few years. And as people perceptions of the future change, having grown more pessimistic over time, is it still possible to maintain Walt Disney's boundless optimism? In some ways, the 1998 New Tomorrowland was an idea that was too early. The concept of retro-futurism is sound as evinced by the rise of steampunk culture. If Disney had gone that direction a few years ago, slapping some extraneous gears on everything in sight, I think it would not have raised as many eyebrows. But even today steampunk's currency will wane as new aesthetics come into fashion. Nonetheless, I believe that the concept of New Tomorrowland was sound, if maybe too specific. If I was given control of the New (to the nth power) Tomorrowland, I would reimagine the land as a celebration of many visions of the future that mankind has expression over the years. I've already decided on a name for the concept: All Our Tomorrows. 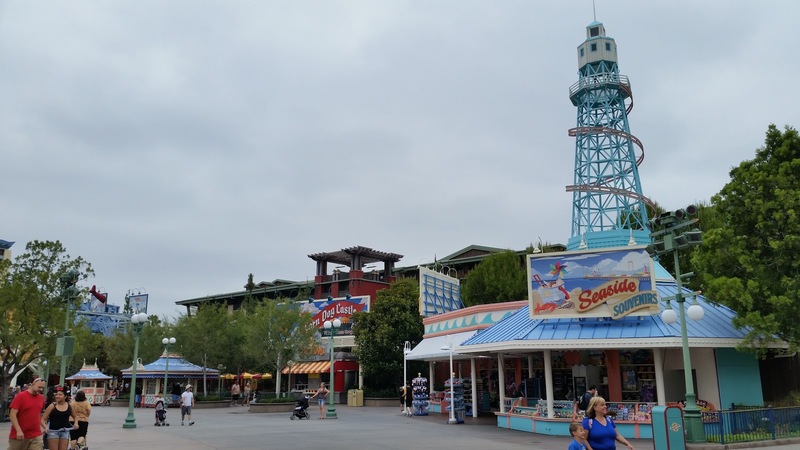 The land would be rethemed so that each attraction more closely resembles a specific era. Space Mountain should lean even more into the seventies' white-plastic-and-jumpsuits vision. The Tomorrowland Theater and Redd Rockett's Pizza Port would be dialed back to 1955, reverting to the future Walt Disney would have envisioned when he opened the park. I envision making the exterior of Buzz Lightyear more like the fictional Star Command while leaving the interior as is. Star Tours, alas, has to go. (Don't worry; I'm just relocating it.) In its place will be some sort of grunge future thrill ride, something like Alien or similar movies. The biggest change would revolve around Innoventions and all points north. Ever since I noticed that Innoventions resembles Jabba's Palace, I knew it was a perfect starting point for a Star Wars themed land. From there through Autopia would be converted to Mos Eisley. Can you imagine Star Wars character dining in the Mos Eisley Cantina? I sure can. On the north end of Mos Eisley would be a hanger building that doubles as the causeway through the shield generator building into the Endor portion. The idea would be to save as many trees as possible so that the land can run right up to Fantasyland without clashing too hard. I'm not sure what rides I want in those areas, but I feel confident that there are ideas to be had. My new Tomorrowland would be connected by concept of the Tomorrowland Transit Authority offering access to several points around the universe, with air - err - spaceport signage throughout to direct travelers to their destinations. And to top it all off, I would install a new Peoplemover to tie the land together and tell the story from a higher level. Maybe even install a second station near the train depot to make it a real transportation system. Now that I've got that out of my system, I'd like to hear from you. What would you do to revitalize Tomorrowland? Theme Parking: Was Someone At Disney A Tolkien Fan? If you read my article from Thursday, you know that I have a thing for Yesterland. Of course, I found myself once again perusing the archives when I ran across an article about a brochure published by Disneyland in 1966 announcing new attractions for the park. I love printed artifacts from Disneyland, so I was fascinated by the article. Especially by the last page. Straight up stolen from Yesterland. It has a watermark, so it's okay. Fun logo, sure, but look at the type face. Does it seem familiar to you? 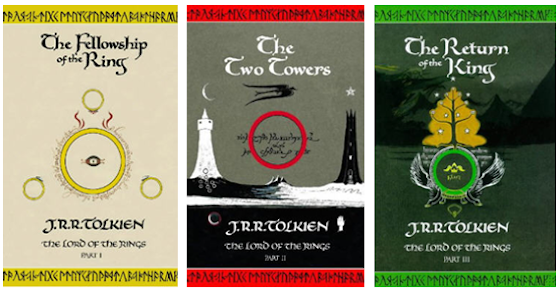 By 1966, The Lord of the Rings was a certifiable phenomenon, pervading the culture and counterculture. I cannot imagine that an artist working for Disney was not aware of the books. The calligraphy style isn't unique to the trilogy, but the coincidence is too much for me to handle. I know this is a stretch, but come on. Come on. Yes, I'm posting this in the middle of the night because I know just how dumb it is. I would have posted my thoughts directly at Yesterland, but that article is eight years old and the comment section is long closed. So blame Werner. When we returned to Disney California Adventure for the first time ten years, we found a wildly different park than the one I remembered. The entrance and opening thoroughfare were amazing, entirely unlike what I could recall. The airfield zone was closed for refurbishment, but I could not recall its name. There was a Cars Land out of nowhere. I remembered a movie theater, but it seemed to be long gone. 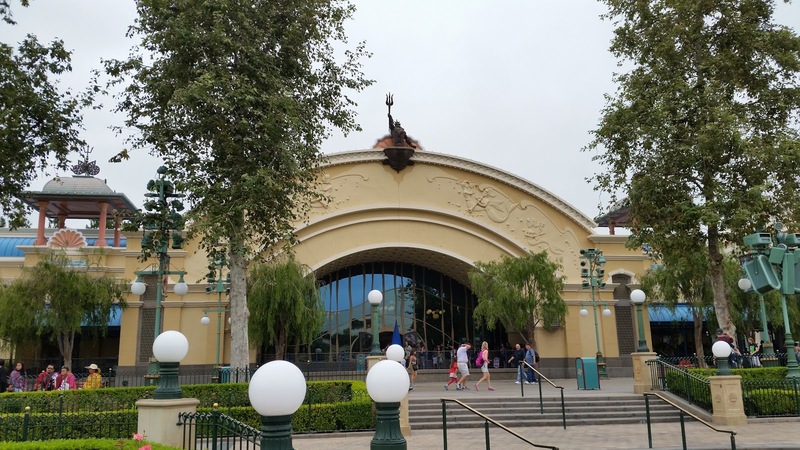 The new park was magical, but in comparison to what? It has been so long since I last visit that I could no longer remember the park that I was comparing it to. Luckily, those old lands and attractions were just a short trip away on the internet. Yesterland is a website curated by Werner Weiss. Opened in 1995, the site was one of the earliest bookmarks I ever set in a browser. 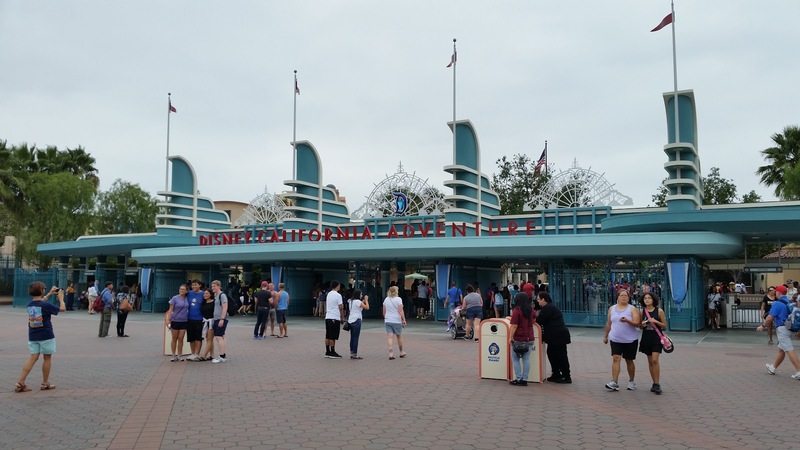 Over the years, Weiss has written extensively about lands, attractions, shops, parades, and even signs that no longer exist at Disneyland and several Disney other parks. He published each Friday, either with a new addition or to spruce up an older article. Several photographs illustrate his articles, letting readers gaze into a past that no longer exists. It would take several days to get through the entire archive. I speak from experience. 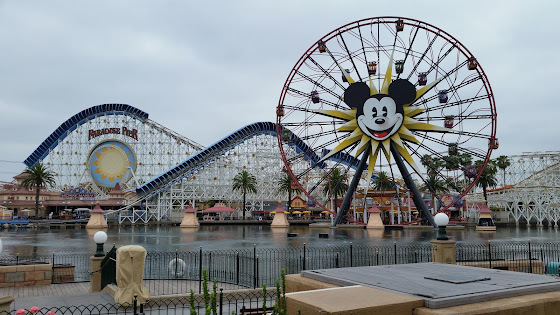 Upon returning home from DCA, I looked up the Yester California Adventure articles. Amazingly, it is already two thirds the size of Yesterland. I had a lot of reading ahead of me. It took several late nights of reading to get through everything. I came out the other side with a much greater appreciation for what Disney had to work with when they redesigned the park. Walt Disney famously said, "Disneyland will never be completed. It will continue to grow as long as there is imagination left in the world." Neither, it seems, will Yesterland. Yesterland will be there to welcome those attractions from yesteryear that no longer find a home in our world. I could not be more grateful for it. During our recent trip to Legoland California, we were once again confronted with the minimum height requirement for several rides. I dutifully walked my daughter over to a sign post and asked her to stand under the height marker. Although her hair brushed the bar, she was still able to stand comfortably under the 40" mark. I looked at my wife and shook my head. We were almost there. No matter which park you go to, forty inches seems to be the threshold for the good rides. I don't know for certain why that number was chosen. Someone must have decided that, once some has reached that height, a person is less likely to flop out of a vehicle. That is several of the best rides in the parks that I haven't ridden in ten years. But did you notice Radiatior Springs Racers on there? That's right. It's the hottest ride in DCA and I don't even know what that ride is. Evidently there's a dark ride portion? I have no idea what to expect! For as long as I've held that little girl, I've wished that she wouldn't grow up quite so fast. But in this one instance, if she really wants to ride on the "Big Girl" rides, I'd be willing to let her grow up a little more.